TenTec Orion II, the radio of my dreams! 17.12.2008 Today my XYL, Jytte told me that I was getting my numero uno wish for X-mas: a TenTec Orion II radio, and told me to order it myself. 05.01.2009 My shiny new Orion 2 arrived today, and I'm in love already! Maybe the SW guys at TT have fixed it in the upcoming release? 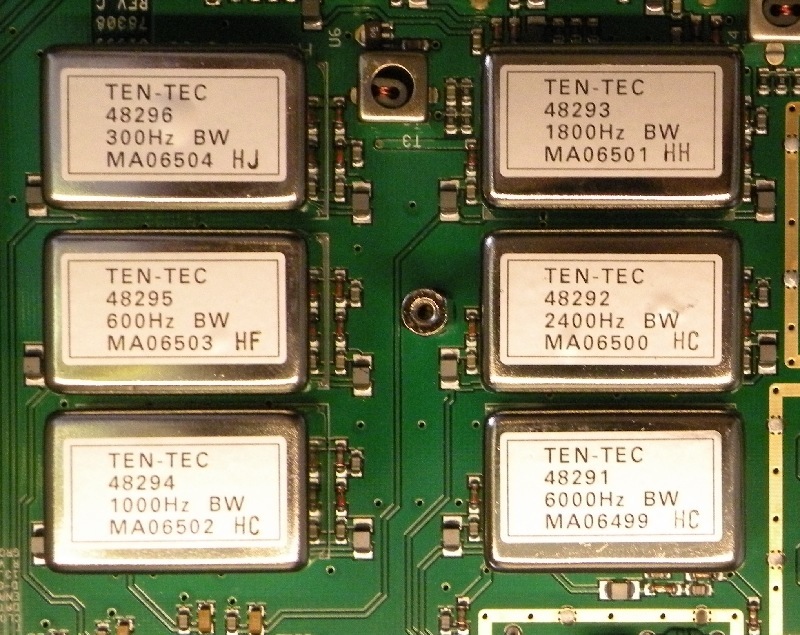 Incredible Rx audio (I'm mostly a phone guy + some Digital (WSJT, WSPR, PSK31 and RTTY)) and reports on Tx audio (I bought the 708A desk mike with it) excellent. Spent about 12 hours with it today, trying out stuff, reading the manual and QSO'ing. 08.01.2009 Taking a leaf from the FT-847 book: Keying the transmitter from the AUX (called Data by Yaesu) port enables AUX-In and disables Mic-Input, and vice versa - should be a very small matter to implement in SW, but immensely useful for the occasional Digital-mode user. 10.01.2009: Several have suggested to use the "User1..User4" personality storage for supplying a quick personality change - excellent idea! I now have "User1" set up for phone with all band, frequency, Mic input and mode settings appropriate for this, and "User2" for Digital modes with "Aux-In" as input etc. Checked frequency accuracy against my 10,000,000.000Hz Rubidium standard today - seems that my radio is abt 34Hz low on 30m. I guess I'll let it burn in a while longer before attempting an adjustment. The spectrum display sometimes freezes after extended period of usage (running WSPR 2min periods with every fourth period Tx). Simply turning Sweep Off and the On again will cure it. 01.08.2010: This has been cured running the 2.044A FW release! 01.09.2009: Our friend from Houston arrived for a visit yesterday, bringing gifts: Additional Roofing filters, to complete what's already there from the factory, and the Fan Kit - 03.09.2009: Full complement of Roofing filters now installed. 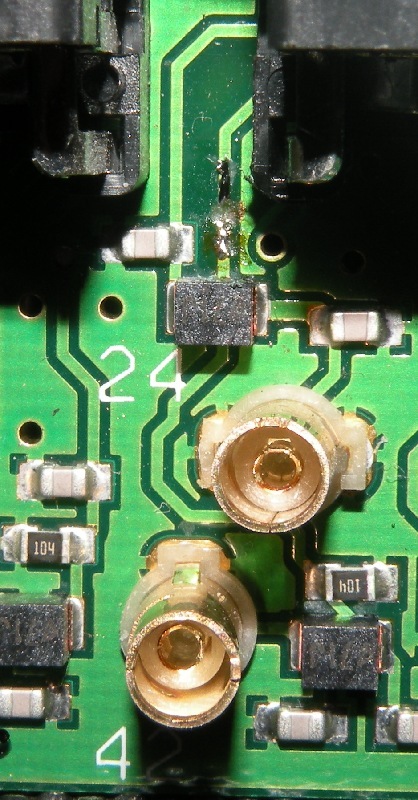 24.10.2010: Last night I finally took apart the Orion to implement a couple of long planned mods; 1) Finally getting the 5V DC present on AUX Pin4 blocked, and 2) create speaker output when Head-Phones are plugged in, and while I'm at get my simple Fan mod documented. 1) Fan mod: I really found the factory supplied fan to loud to have running at full tilt whenever the radion is turned on. Rumaging around in my junkbox I located a suitable fan that was much quieter and almost new, I also found a small thermostatic rev-controller from another fan, and substited the whole kit and cabodle in short order - now the fan only runs when needed! 2) Head-phone/Speaker mod: I often have guests in the shack when either contesting or working DX, I like to use my Head-phones, but my guests would also like to be able to listen to the received audio an addition to my pleasant voice. 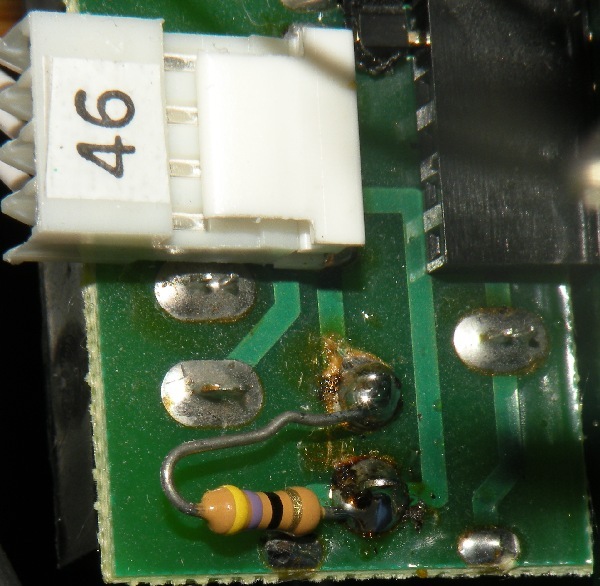 On my FT-847 I bridged the speaker-off switch with a 47 Ohm resistor (see my FT-847 mod section) leaving the speaker on, albeit with reduced volume, when plugging in the Head-phones. 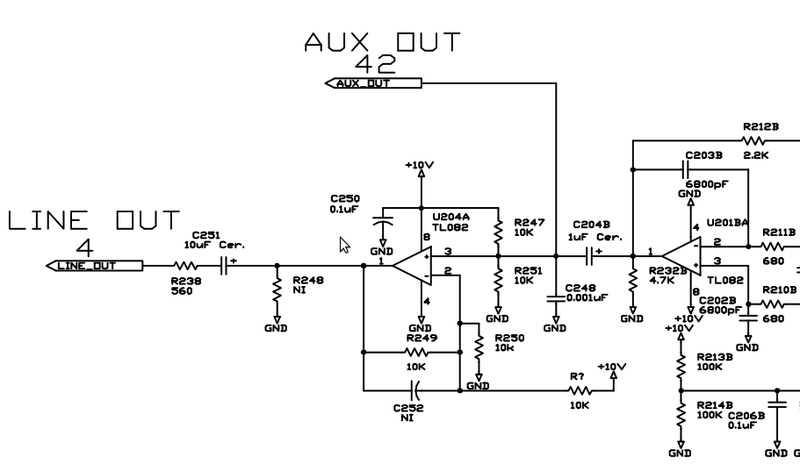 Here I tried to apply the same mod, but had to realize that this radio is far more sophisticated - it's not a simple switch in the speaker lead, but rather a commend to the audio processor to either supply or not supply audio to the speaker! Today I realized that this does NOT work, It leaves the headphones on - at a fixed volume..... A better mod is wanted! Anyway - the 47 Ohm resistor does the job of signalling that audio to the speaker is wished for, even when the Head-phones are plugged in, so I just left it as shown. 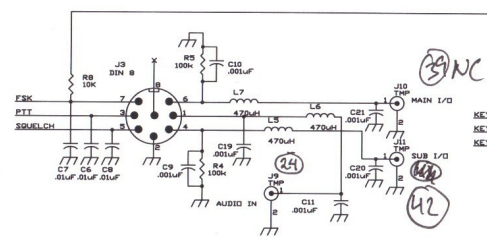 where it's applied to Pin4 of the AUX connector through a low pass filter, with requisite DC block omitted. 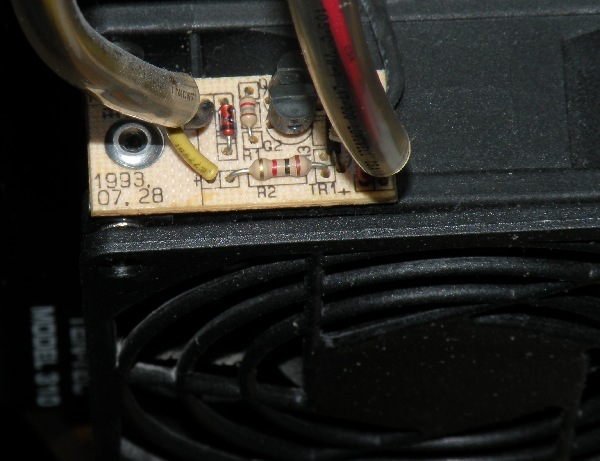 My investigation has uncovered that there at one time (2003) was a modification to the circuit to include such a DC block, but at some later date (2005) when the LP filter was added, the DC block was left out - probably by oversight. Of all the Orion1 and 2 owners I have enquired about this malady, only one 2 owner had a DC block in the circuit - and it was shorted! I know - it's not very neat - there's very little room to work in (to give an idea of scale, the other SMD capacitors are size 805), but it works! 02.02.2012: Wauv FW V3.026 has arrived! Looks very good on my 566AT. Found an old version of XP (Native multiboot) on my laptop, and ran update here (again using the Prolific adapter) no problems this time, followed instructions to the letter and everything works fine! Oh, one thing though: the Prolific adapter installed as COM4 - that didn't work, had to rename to COM1 - then it worked just fine - riddle me that?